We came back from Spain this week after a lovely week of relaxation, very nice weather (I am a bit brown!) and lots of lovely trips out on our bikes. 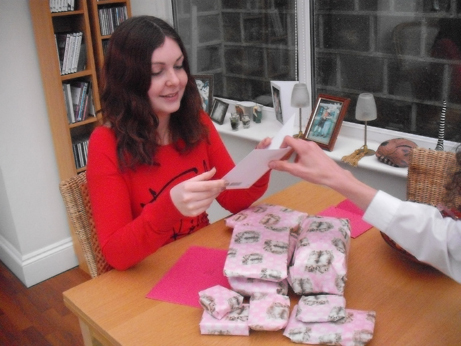 We left on Ellie’s 19th birthday – here she is the day before opening her pressies – Happy Birthday and enjoy your last year of being a teenager! Ellie with her pressies - though money was the most gratefully received gift - poor student! 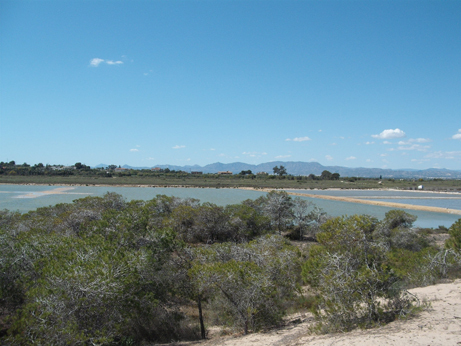 Poor Ellie has had a bad back so she was only able to come out on a couple of bike trips but Jake and I did some really good long ones.One of my favourite was a trip we had not done before down to the next beach along from La Marina, El Pinet, which is a nature reserve with really good views of the salt flats and my beloved mountains! 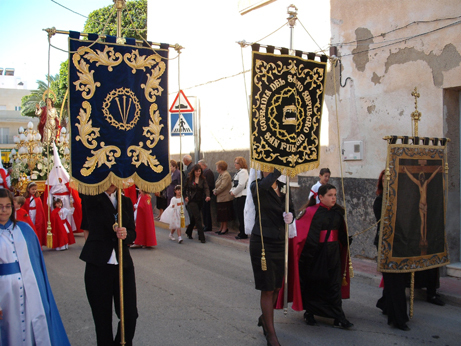 We also had two chances to see the Semana Santa (Holy Week) celebrations with trips to the parades of icons in both Torrevieja and San Fulgencio. The Torrevieja parade on Good Friday was very crowded and as it took place about 9pm was difficult to get good pics – but the place looked lovely with all the candles in the maces the participants were carrying. There were four large icons including a last supper representation which were all very impressive. 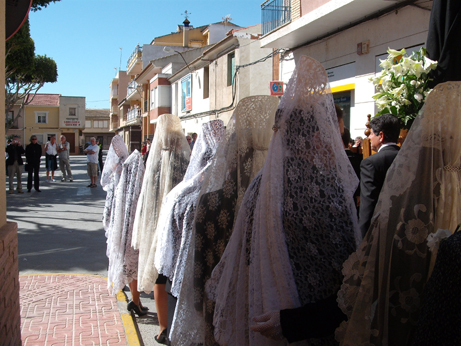 The San Fulgencio parade was on Easter Sunday morning and it was a beautiful sunny day. San Fulgencio is the nearest small town to La Marina and there were not many people there so lots of opportunity for good pics. There were two icons – Jesus and the Madonna and also a beautiful parade of women dressed in very stylish black suits with lace mantillas and traditional combs which looked wonderful. The Madonna started off being covered in a black veil then after she had been taken round the main streets she was uncovered and the infant Jesus put in her arms – she was then paraded around the main square with the band playing before being taken back to the church. A lovely holiday – can’t wait to go back though it will probably be next year now before we go again. Not much knitting and stitching has been going on though I did get a few more rows done on the latest hat I am working on. This pattern comes from the April issue of Let’s Knit and I wanted to do it to try out the lacework pattern which has worked well. 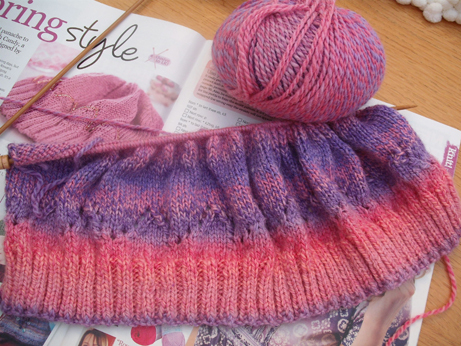 It is knitted in Sirdar Escape yarn which is variegated. I don’t think I will be keeping this hat – lovely though it is as it is slightly the wrong shade to go with my Spring coat so will use it as a present. 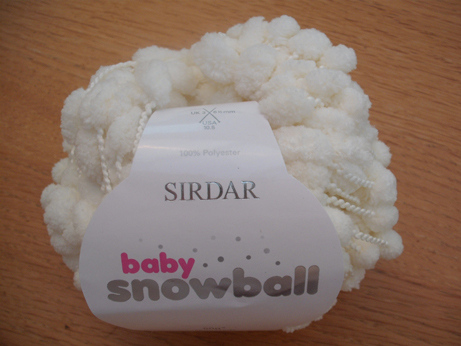 Also got a bit sidetracked from that just before we went away as Helen from Woolly Minded and Beady Eyed had just had some Baby Snowball delivered so I had to buy some of that to make a baby blanket. 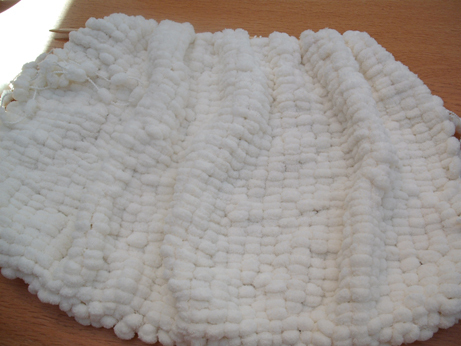 It is so soft to work with and feels wonderful when knitted up. ... a very cuddly blanket! 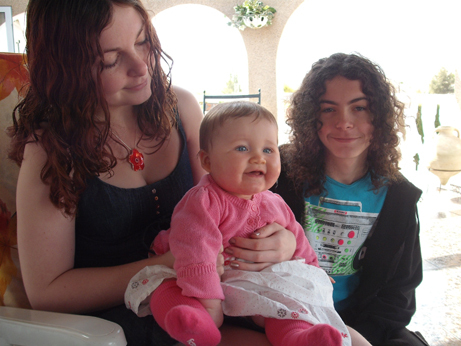 We have had and are expecting some new additions to the family – we met up with my cousin Neil and his wife Vicky in Spain with their gorgeous 8 month old baby Anna-Mae who we had not met face to face before and my other cousin Joanne is expecting a baby in a few weeks – more chance to knit! Beautiful Anna-Mae who really liked Jacob's hair! I have also just started a new cross stitch piece for the ASOE exchange – theme (unsurprisingly!) is Spring so am hoping to finish that this week. Also need to get cracking on some new re-enactment clothes for Jake as he has grown again so will be cutting out new hose and brais this weekend. Our first event is in two weeks time at Bolsover Castle for St George’s Day weekend followed by the first May Bank Holiday in South Wales at the Cosmeston Medieval Village so am really, really looking forward to being under canvas again! Have a really busy few weeks coming up with work – normally things get quieter for a bit after Easter but we are running a taster course for people who may want to become Literacy and Numeracy teachers so I start that next week. Does mean there will be less time for creativity but on the plus side we get to do some fun Maths things! Hope that you all have had a nice Easter – thanks for visiting.